Ford is betting big on its new Ford EcoBoost 1.0 litre engine as the same is smaller, powerful, fuel efficient and emits comparably less pollutants. As of today the engine has become extremely popular solely because of how well it performs and adding to the list of achievements of Ford is the latest award that the engine has bagged. 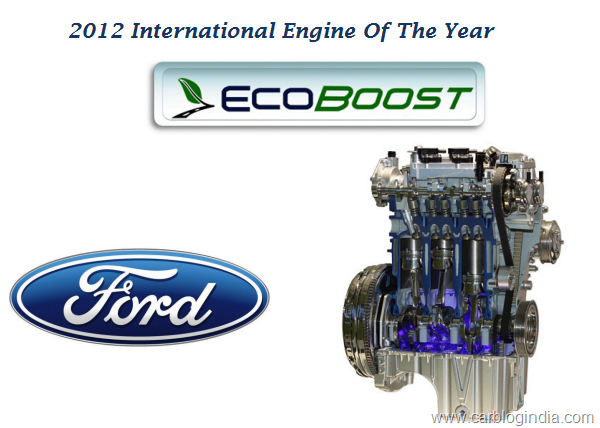 The much coveted International Engine Of the Year Award is now in the hands of Ford and the credit is to be given to this 1.0 litre Ford EcoBoost Technology engine. What makes the award even more special is the time span of 13 long years of wait after which Ford is finally bagging an award at this prestigious event. Best the ‘The International Engine’ award the engine was also crowned ‘Best New Engine’ and ‘Best Engine Under 2.0 Litre’ which is great. In 2011 it was Fiat’s 0.9 litre TwinAir engine which won this award but it could not defend its title this year as the EcoBoost unit was stronger. The EcoBoost engine is so well evolved that it can pull a car of Ford Focus’s size with least effort and this is an inspiration for other carmakers. The engine can deliver close to 120 BHP when installed in a sedan like the Audi A4, this is interesting enough. The 1.0 litre EcoBoost unit will be seen in the upcoming compact SUV, Ford EcoSport. However it is to be seen whether the current market scenario where diesel engines are in demand, will accept the engine wholeheartedly or not. Check out the latest new on Ford EcoSport SUV here.